Once considered outside the city of London, Greenwich is home to a host of sights including the National Maritime Museum and a regal former Royal residence. Greenwich is where eastern and western hemispheres meet and where you will discover breathtaking views, lovely markets and amazing attractions, all in a beautiful riverside setting just minutes from central London. 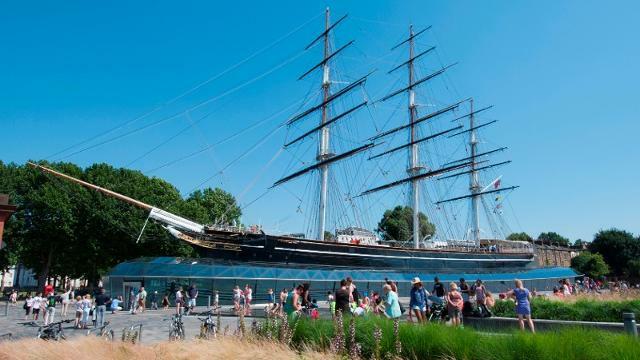 First up is Cutty Sark, located right outside of the exit of Greenwich’s easily accessible DLR station. Climb aboard the world’s last surviving tea clipper, which was built at the end of the golden age of sail. Discover what life was like aboard the 19th-century ship, find out how she brought tea from China, and walk beneath the hull that made her one of the fastest ships of her time. After The Cutty Sark, The Queens House is only a short walk away and will take you on a similar journey back in time. Designed by the pioneering architect Inigo Jones, the Queen’s House is a masterpiece of 17th-century architecture. Conceived as a ‘House of Delight’ for James I’s Queen, this exquisite former royal residence is set in the leafy surroundings of Greenwich Park with spectacular views of the River Thames and the contrasting skyscrapers of Canary Wharf beyond. For more interesting Royal history be sure to check out London Top Sights Royalty tour. Located beyond the Queens house is the vast Greenwich Park. Overlooking the River Thames it is home to one of London’s most iconic views, as well as an amazing mix of 17th century landscape, stunning gardens and a rich history that dates back to Roman times. The park’s 183 acres has something for everyone. At the park you can stand on the Prime Meridian, the reference point for the rest of the world, and visit The Royal Observatory which is managed as part of the National Maritime Museum and contains the Astronomy Centre, Flamsteed House and the Meridian Courtyard as well as the Peter Harrison Planetarium, London’s only planetarium. 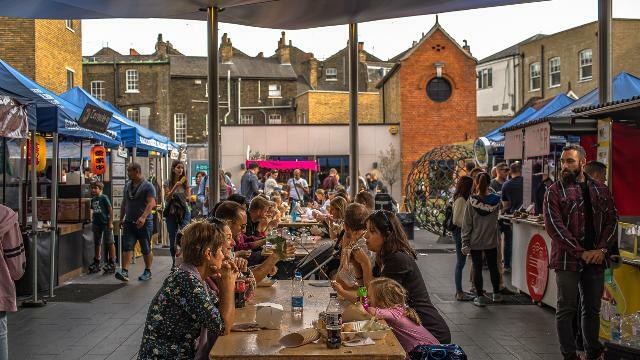 While you can easily spend a whole day in the park with all of its activities, be sure to head back down to the village in time to take in some of Greenwich’s world famous markets. Greenwich Market is home to carefully chosen designer-makers, artists, antiques dealers, beauticians and delicious food from all around the world. It’s recently been refurbished and polished up with a new roof and extra space for food lovers. Up the road is Clocktower Market which has over 50 stalls with a fascinating range of collectables and vintage, including military memorabilia, antiques, art, badges, books, ceramics, vintage clothing, crafts, furniture, jewelry and records. You definitely won’t leave empty-handed! Interested in more tours? London Guided tour? Private sightseeing tours London? London Food tours? See below!